After having a great meal last week at Red Mesa, thanks in part to sampling the restaurant at the Taste of Pinellas food festival, we decided to give another Taste of Pinellas restaurant a try. 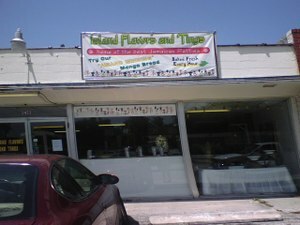 On Saturday, we stopped by Island Flavors and 'Tings on 49th St. S. in Gulfport for lunch. Big mistake. I now wish we would have kept driving and made lunch at home. I was quite optimistic when I got out the car. Island Flavors has the hole-in-the-wall look on the outside that can often signal good eats. Inside there is a small Jamaican grocery in the front and a counter to order food in the back. We decided to dine-in (there is a set of tables down one wall), which probably only made our experience worse. A trickle of customers came in to pick up orders. Traci and I both ordered the jerk chicken salad. The server never asked us for drinks so we settled for glasses of water with meager ice which weren't refilled until the end of the meal. Since the server warned us it would take 10 minutes for our salads and the plantains we ordered to come out, we ordered two meat patties (one beef and one supposedly chicken) out of the case at the counter. The beef was okay, while the chicken was in fact a vegetable patty. This was not a good start. When our salads finally came out Traci's had chicken on top while mine was chicken-less. The server apologized and said they had just forgotten to put chicken on my salad. Huh? After my salad came back out with chicken, we realized that they had also forgotten about our plantains. However, after tasting the salad (the presentation was beautiful at least), we decided it wasn't worth bugging them for the plantains. The salad was average at best with the jerk chicken surprisingly lacking in flavor. I could have gotten this chicken at Boston Market. The server didn't clear our plates after we were done eating; we eventually walked up to the counter to pay. I am all for a laid-back Caribbean attitude and I've dined at many a hole-in-the-wall, but come on. Even paying was a drawn-out process. I don't know how they're still open. Bottom-line: Maybe we just caught Island Flavors on an "off day" and salads aren't their thing, but I can't recommend anyone check this place out. Get your Caribbean food elsewhere.